95% of cut (faceted) moldavites offered on the market are fakes. 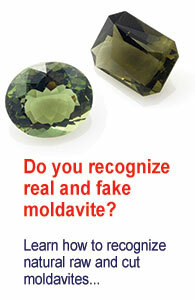 I have prepared a well arranged infographic description of how to recognize real and fake faceted moldavites. Please insert your name and e-mail address. I will send you the infographic immediately. Your email address will not be shared or sold to another subject. I finished an ultimate guide – how to recognize a real moldavite from a fake. In this guide you will learn how to recognize natural cut, raw and other forms of moldavites.